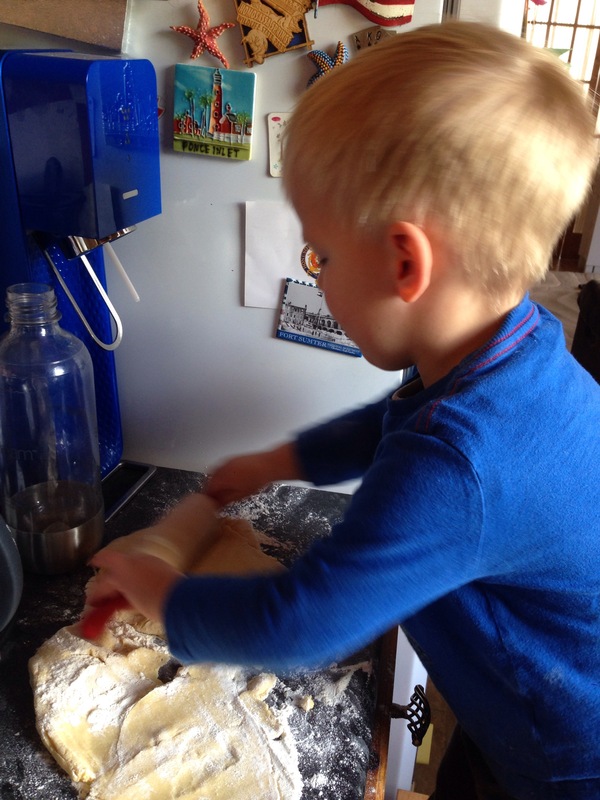 This morning James was so keen to make biscuits that the was carrying around a biscuit cutter, a whisk, and some measuring cups until I got showered and ready! I checked the cupboards and found only self-raising flour, having used the out of date flour and the very end of a packet of plain flour in the garden a few weeks ago. Now, in the recipe book inside my head, the biscuits are made with plain flour. Siri was no help (have you ever asked Siri how to make biscuits? He knows rather too much about the wrong kind of biscuits, I feel), so I obviously asked my mum. Mum told me a fabulous solution to this – make a cake mix, but thicker. Bam! So that’s what we did. I weighed everything and then got the electric whisk out. James instantly covered his ears. I’m not sure any more if he really is bothered by the noise, or if he just does this out of habit. James doesn’t like the whisk noise! We poked a hole in the top of some of the biscuits, and put a tiny blob of jam inside. James doesn’t like jam, but I thought it might be nice for us to have a sweet treat when he’s gone to bed! They are really fluffy and yummy, but not overly sweet, so it’s a nice activity for toddlers to be involved in, and not too bad for baby lead weaning. Preheat the oven at 190C. Chuck the egg, the butter, and the sugar into a bowl. Add about 100g of flour, then whisk it all up into a batter. Keep adding flour till it goes nice and dough-like. We ended up with roughly 200g, you might need more or less depending on the size of your egg, really. Roll out the dough, cut out the biscuits, and place them on a greased baking tray. Put them in the oven for about 10 minutes. I had just enough time to get both boys dressed for the day in the time it took for the biscuits to bake! This is great! I love to bake but generally follow the no planning and see what’s in the cupboard approach. This is a fab way of making biscuits. Thanks for sharing. I used to love cooking with my pair when my little ones were younger. Looks like he enjoyed them.